Columbus-based modern fusion juggernaut Safety Squad, led by keyboardist Danny Bauer, is set to release the follow-up to their excellent 2016 self-titled debut before heading out on tour this spring (tour dates here). 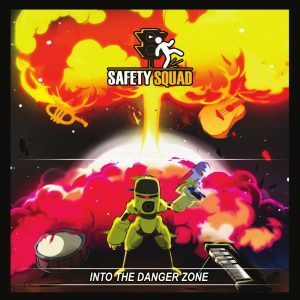 Woodlands Tavern will host the Album Release Party for Safety Squad’s Into The Danger Zone on Friday, April 6th. Tickets are available here. Doors open at 8pm, and funky live hip-hop band Mistar Anderson will open the show. I had the opportunity to hear some of the new tracks live at Rumba Cafe back in December before the band went into Oranjudio to record, so I’ve been anticipating this one for a while! Keep reading for my thoughts on this 6-track effort that reveals a band coming into its own in a powerful way, as well as videos of album tracks. Expertly tracked and mixed by Tony Rice and mastered by Rainer Gembalczyk, Into The Danger Zone is a vibrant document of Safety Squad’s bright and dynamic sound. Kicking off with epic chords, opener “Sequence Break” settles into a sleek groove with a searing melody powered by the horn section. Bauer’s synthesizer solo exudes futuristic soul and is especially effective on an unaccompanied breakdown, which sets the stage for tenor saxophonist Justin Dickson to ease into his own passage that builds in drama and intensity leading to a soaring full band conclusion. “The Big Crunch” comes to life using the guitars of Jordan Millisor and Zakk Jones before establishing a swaggering melody boosted by accents from the percussion section. John Allen’s glimmering bass solo gives the upper register of the instrument an extended workout, with well-placed accompaniment from organist Andrew Willard and the band. “Machine Learning” has an appropriately electronic open, laying the groundwork for the horn section. Jones unleashes a bluesy, earthy passage and trombonist Elaine Mylius blows a heartfelt solo that ramps up when the band intensifies the groove before an extended funky breakdown. The horns are out front with plenty of heart and soul on “Mr. Mungo’s Revenge,” which incorporates an attention-grabbing percussion break and soon finds Willard testifying on his organ to show-stopping effect. Drummer Matthiessen Nisch Quan sets the course on “Wine Chant” with a subtle rhythm before a fluid guitar melody leads the band into battle. Jones shreds over a percussive uptempo groove, which gives way to a more dreamlike vibe that is perfectly suited to tenor saxophonist Kevin O’Neill’s effortlessly soulful blowing. Finale “The Singularity” opens sparsely before gaining steam and bringing in another emphatic horn line. Willard’s electronically-minded keyboard solo slowly builds, with help from the rhythm section, before a hypnotic keyboard pattern is joined by in the forefront by an elaborate drum solo by Nisch Quan that leads to one last dance-ready groove. Introducing the first of six (!!) new music videos from the "Into the Danger Zone" album, we are happy to share with you our brand new song "The Big Crunch"! Share this video with any friends that need some funk in their life, and we look forward to seeing you at one of our upcoming shows on the April tour!